In the early twentieth century, a Yoruba ruler commissioned this architectural column from one of the most renowned sculptors in the history of Yoruba art, Olowe of Ise. 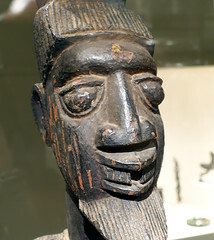 Born in the nineteenth century in Efon-Alaiye, a famed carving center, Olowe moved as a youth southeast to Ise. There, his artistic reputation was established when he carved a program of architectural sculptures for its king, the Arinjale. Subsequent commissions of architectural sculpture for the palaces of other regional leaders brought Olowe even greater recognition as a master sculptor. Admired by his contemporaries, Olowe’s artistic talent is recalled in oriki, or praise poems, composed in his honor. His accomplishments were also recognized in the West. In 1924, a pair of his palace doors was exhibited in London and acquired for the British Museum. Olowe created this veranda post, one of several, for the exterior courtyard of a Yoruba palace. 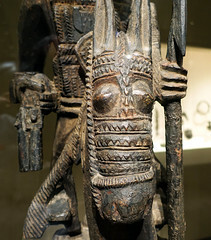 Carved from one piece of wood, the composition combines two classic Yoruba icons of power and leadership. The most prominent of these is the equestrian warrior, who is depicted frontally sitting regally on a diminutive horse. He holds a spear and a revolver. 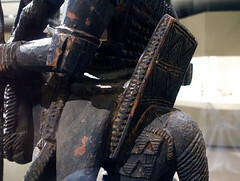 The image of the mounted warrior symbolizes the military might needed to form kingdoms. Local leaders adopted this image to validate their rule. At the base of the post, the kneeling female figure is depicted as the dominant form. In Yoruba culture, women are honored as the source of human life and embody ideas of spiritual, political, and economic power. These allegorical representations underscore the wealth and power of the ruler who commissioned the work. 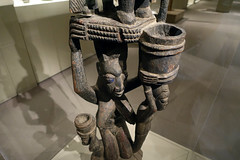 Here, as in other examples of African sculpture, proportion and scale are altered and exaggerated to symbolize ideas. The disproportionately large heads represent character, self-control, and motivation. Eyes are large to suggest awareness. Among the Yoruba, the most beautiful people have a gap between their upper front teeth. The woman’s exaggerated breasts symbolize her ability to have children and to nurture them. The woman is represented slightly larger than the warrior, suggesting that she is the essential support. 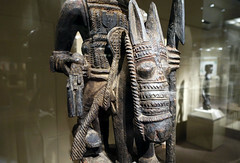 The warrior’s horse, less important than its rider, is depicted as smaller. The subordinate role of the two youths by the woman’s side is suggested by their small scale. Stylistically, Olowe was very innovative in his composition. He is especially known for the manner in which figures project beyond the immediate boundaries of the sculptural space. 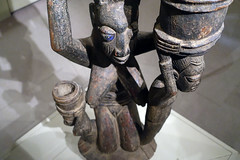 Here, instead of the usual Yoruba practice of depicting figures in frontal poses, he sculpted the female figure turning toward the left with the two smaller attendants radiating outward at oblique angles. The compressed style of the upper portion of the column, with its weighty and self-contained equestrian figure, contrasts with the sense of kinetic energy created by the dynamic composition of multiple figures below. The sculpture’s formal complexity is enhanced by its textured surface, with details originally painted in black, white, and royal blue. The deep carving style was well suited to the intense raking sunlight of its original setting just inside an exterior veranda. The Yoruba, who live in southwestern Nigeria and southern Benin, are a diverse people with a rich cultural and artistic heritage of considerable antiquity. Although they number over 15 million people, the Yoruba embrace an overarching common identity through shared language and history. 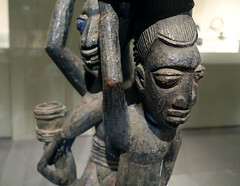 They trace the origins of both life and civilization to their founding city of Ile-Ife, which was a thriving urban center by the eleventh century. 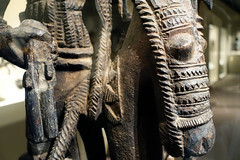 In the centuries that followed, numerous autonomous city-states developed, related through professed descent from Ile-Ife. In general, each city-state was governed by a sacred ruler, whose power was balanced by a council of elders. Artists working for these regional leaders produced a wide range of art forms designed to glorify the status of the king and his court. Cite this page as: Dr. Peri Klemm, Dr. Steven Zucker and Dr. Christa Clarke, "Olowe of Ise, veranda post (Yoruba peoples)," in Smarthistory, August 9, 2015, accessed April 23, 2019, https://smarthistory.org/olowe-of-ise-veranda-post/.